Cheathata Angkor Hotel is perfectly located in the heart of the Angkor capital. It is positioned in the center of Siem Reap with easy access to all lively areas in town. The hotel strives to offer guests with impeccable services to make your stay a memorable one. Guest can explore the famous historical site of the Angkor Temple and the beauty of the Tonle Sap Lake. Cheathata Angkor Hotel offers high quality rooms and essential facilities with an exotic ambience. There are more than 20 rooms ranging from deluxe to Colonial suite, and every room is tastefully decorated and well-equipped. Cheathata Angkor Hotel features one large swimming pool with swim-up bars to keep your taste buds happy. Short Description: Cheathata Angkor Hotel is perfectly located in the heart of the Angkor capital. 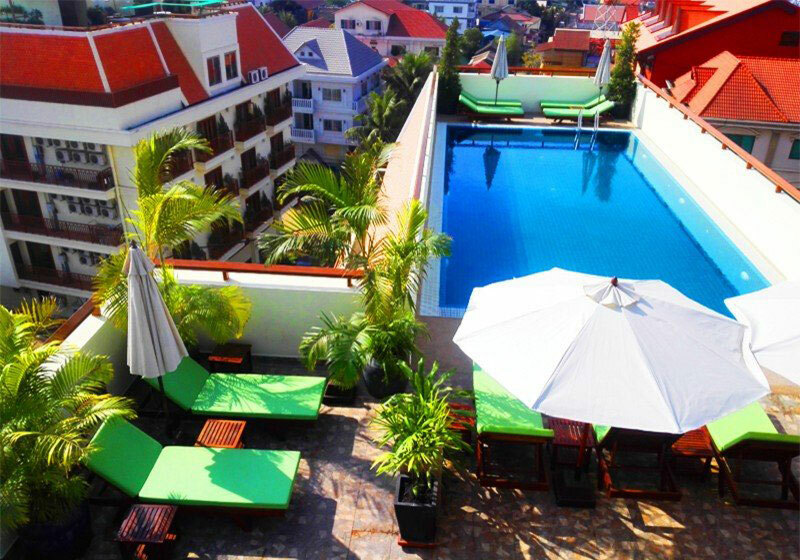 It is positioned in the center of Siem Reap with easy access to all lively areas in town. The hotel strives to offer guests with impeccable services to make your stay a memorable one.